If you are looking for a good book to read about Joan of Arc and have limited funds then try one of the complete books available here online at MaidOfHeaven.com. The list below contains some excellent biographies by renowned writers. Monk of Fife: A Romance of the Days of Jeanne D'Arc by Andrew Lang Another fictional account of Joan's life focusing on the Scottish soldiers that fought alongside Joan of Arc with the French. This book is also easy to read and entertaining but does not focus as much on the life of Joan as Twain's biography. Published in 1916 as part of The Children's Heroes Series. Jeanne d'Arc: Her Life and Death by Mrs. Margaret Oliphant is a well written and researched book that will give any reader a good history of Joan of Arc's life. Published in 1896 as a volumn in the Heroes of the Nations series. Good biography about Joan of Arc that covers her whole life in a single volume and is a worthwhile read for anyone wanting to learn the history of Joan of Arc. Published in 1896. The Maid of Orleans by Friedrich Schiller is an excellent play about Joan of Arc by famed political philosopher Friedrich Schiller. The play does use a lot of "artistic license" so don't expect to get a completely accurate history of Joan's life but is is entertaining to read. The Trial of Jeanne d'Arc by W. P. Barrett is the complete transcript of Joan's trial of condemnation translated into English. Not as entertaining as some of the fictionalized books about Joan but an extremely valuable resource for anyone wanting to really learn about Joan and her history. Joan of Arc Biography by Jules Michelet are the chapters from Michelet's famous History of France and comprise an excellent Joan of Arc biography written by the renowned French historian. Joan of Arc by Ronald Sutherland Gower is an illustrated biography published in 1893 that gives good coverage of Joan of Arc's life and legacy. Joan of Arc Biography by Philip Henry Stanhope was published in 1853 and provides good coverage of Joan's life in a well written and easy to read book covering her whole life. A Heroine of France: The Story of Joan of Arc by Evelyn Everett-Green is a historical novel published in 1903 that is aimed at younger readers but provides a good history about Joan of Arc and is entertaining and easy to read. JOAN OF ARC The Warrior Maid by Lucy Foster Madison is a historical novel published in 1919 that does a good job of presenting the established history of Joan of Arc in an entertaining and easy to read manner and contains some beautiful illustrations. The Life of Joan of Arc by Anatole France is a lengthy two volume biography published in 1909 however it is not one of the better biogrphies about Joan despite the author being awarded the Nobel Prize in literature in 1921 based to a large extent upon his work on this biography. The Broken Soldier and the Maid of France by Henry van Dyke is a fictional story about a WWI soldier and Joan of Arc. Joan of Arc Play by J.A. Sargant is a play in five acts written in 1840 that is entertaining and covers the basic history of Joan of Arc. Henry VI Part 1 by William Shakespeare is a play very loosely based upon Joan's life. Yes this was written by "The William Shakespeare" but unfortunately it is not one of his better works. In fact, the historical accuracy is so bad that some have tried to claim that Shakespeare never actually wrote it. Shakespeare's Henry V provides excellent coverage of the famous Battle of Agincourt which was a crushing defeat for the French and created the desperate conditions in France that necessitated the miracle that Joan of Arc provided. Understanding the negative effects that this battle had upon France is essential to understanding the huge role that Joan of Arc played in helping France to ultimately win the Hundred Years War. Famous poem written in 1429 by Christine de Pisan who was a contemporary of Joan's. Contains an English translation by Ben D. Kennedy with the original French. ARE YOU LOOKING FOR A PARTICULAR JOAN OF ARC BOOK OR OTHER ITEM? 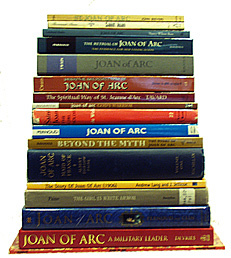 Try the Joan of Arc Marketplace page for a list of several hundred books, movies, music and other commercial products related to Joan of Arc.